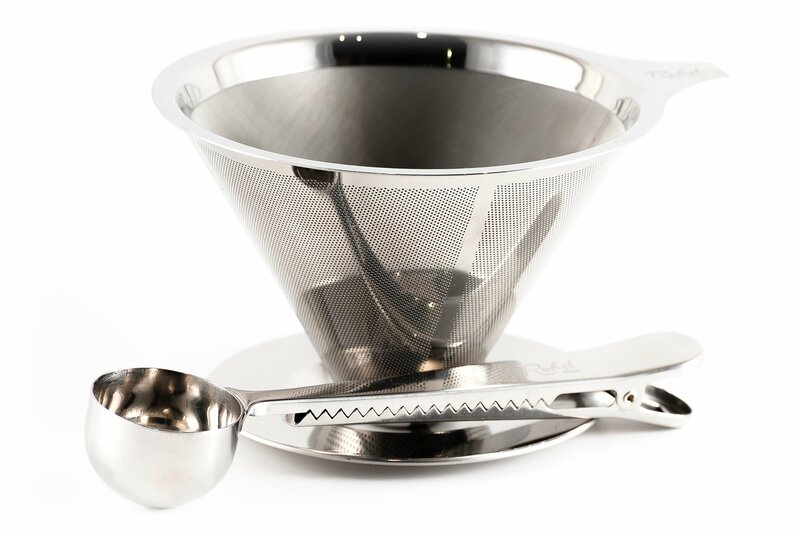 Home › Home and Kitchen › Rohst Reusable Pour Over Coffee Dripper - Paperless Stainless Steel Filter Wi..
Rohst Reusable Pour Over Coffee Dripper - Paperless Stainless Steel Filter Wi.. This durable, single piece brewer is built with 18/8 (SUS304) stainless steel and requires no paper filters, saving your wallet and the environment. No paper also means you enjoy more of the aromas, oils, and nutrients in your coffee. The base of the dripper is just under 4 inches, allowing it to fit on top of most coffee mugs, carafes or thermoses. It is also light weight and compact enough to use when you travel, whether it be on vacation in a hotel or while camping, hiking or enjoying other outdoor activities. The cone design of this coffee maker helps you get the most flavor out of each cup of coffee and allows for easy cleaning. Simply dump the left over grinds and wash with warm soapy water or place it in the dishwasher. The scoop and bag clamp is also great for measuring your coffee and keeping the beans in the bag fresh. Buy from Rohst Coffee Co. with confidence. We know our product quality and gladly offer you a 100% money back guarantee. Buy now and enjoy your coffee! Pour over - Popular and Practical Enjoy the full flavor of your coffee with the Rohst pour over dripper. Thispermanent filter has the ability to save you money with no paper filters, togive you greater control over your cup of coffee and allow you to enjoy all ofthe aromas, nutrients, oils, and flavors of your coffee, without a cup full ofgrounds. Easy to use anywhere The light-weight design and easy to use coffee brewing method is a greatoption anytime, anywhere. Just place the Rohst dripper on top of your mug orthermos, scoop the desired amount of coffee grounds (ground to about the sizeof sea salt) in the dripper, pour a small amount of just below boiling waterover the fresh coffee grounds to let it bloom. This releases some of thedesired aromas and gasses from your coffee to give it the fullest and mostenjoyable flavor. Pour the remaining water over the fresh ground coffee in acircular motion until your cup is full. Enjoy. For best results, we recommenda goose neck type kettle to control your pour. Paper or Plastic? Nope - Stainless Steel Paper coffee filters absorb some of the natural oils and beneficial nutrientsin your coffee. Plastic - well, it just breaks. The Rohst pour-over coffeedripper is made with durable 18/8 (SUS304) stainless steel, it is eco-friendly, efficient and superior. Save your wallet, help the environment, andenjoy that full bodied, perfectly brewed cup of coffee. Buy with Confidence Rohst is a small, family owned business. We value our customers and we lovecoffee. We have personally tested this coffee dripper and use it daily in ourcafe. We love it and we know you will love it too. Get one for yourself or asa gift for someone special. Enjoy.